The National Committee for West Papua (KNPB) has urged the police authorities in West Papua to agree to the transfer of Buchtar Tabuni who is now in custody and on trial to the special prison for narcotics offences in order to ensure that he receives the necessary treatment for a stomach complaint and low blood pressure. Spokesman for the KNPB, Wim R. Medlama said that if he remains in a police cell, there is no guarantee that he will be able to get proper medical treatment. The same matter was raised previously by Buchtar Tabuni during a court hearing in his own trial, shortly before Lebaran, the final days of Ramadhan. The chairman of the panel of judges at the trial said this was a matter for the police and the prosecutor who are still engaged in getting him convicted of involvement in activities to cause damage to facilities in the prison where he was held. Meanwhile, the chairman of the Paniai branch of the KNPB strongly condemned the security forces, the TNI (army) and the police, for having conducted operations against the chairman of the KNPB, hunting down and arresting its members and urging that such operations should be immediately halted. 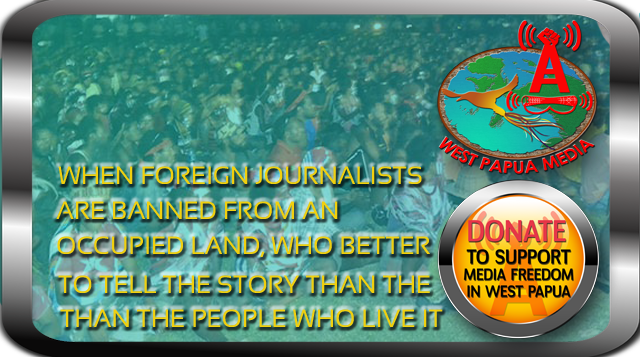 These shootings were taking place because Papuans continue to uphold the opinions they have held since 1961. All the efforts being made such as the setting up a development agency known as the UP4B to improve the standard of living of the Papuan people will never halt the resistance of the Papuan people. ‘The Papuan people will continue to wage resistance and the only way to end this is by holding a referendum in Papua,’ he said. The independent human rights activist, Sebby Sambom, said that it was deeply regrettable that the police force in Papua had used acts of brutality to prevent the KNPB, the National Committee for West Papua, from conducting an action on Monday 4 June. As a result of the police actions, one life was lost and others were injured, including KNPB members and members of the security forces. He said in a brief message to JUBI that the security apparatus had acted against the law and violated freedom of expression which is guaranteed according to Article 19, para (2) of the International Covenant on Civil and Political Rights. Indonesia ratified the Covenant under Law 9/1998. Sebby accused the police for not respecting basic human rights which has resulted in the serious crisis situation now prevailing in Papua. ‘This is a humanitarian crisis by a colonial government which refuses to respect universal human rights,’ he said. He said that the problems in Papua can only be resolved if there is intervention by the international community.